Are you considering living in Montclair, CA? Amidst the windy streets and steep terrain, the Montclair Hills above Oakland provide some of the most spectacular views of the bay. At the base of the hills and nestled next to the Hwy 13 you will find the neighborhood of Montclair. Along with two fantastic elementary schools and a decent (and getting stronger every year) middle school you will find an adorable public library that hosts a toddler story-time, Pop-up Teen Zones. Montclair also boasts a beautiful park with play structures, skate ramp, tennis courts, and man-made lake with huge koi pond full of fish, and a family of turtles. Montclair Village is the local business district. The Village consists of only a few streets but you will find everything you need here. Many of the businesses are run by the same people who opened them years ago. People from all over the bay come to The Village to shop at the unique stores, enjoy a latte at a coffee shop, or dine at a sidewalk café. The businesses and residents take pride in the village which makes it a comfortable place for visitors. Along with the awesome Farmer’s market every weekend where folks do their shopping and catch up with each other, there is a fabulous nursery called Thornhill Nursery that has every variation of plant or flower you could ever want. 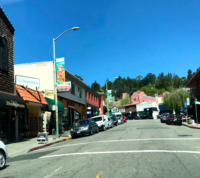 If you want to live in a green oasis smack dab in the middle of Oakland, with access to the best restaurants, incredible weather, top-rated schools, and miles of hiking then Montclair is the place for you. Hula – cute little boutique with lovely pieces of jewelry and clothing. McCaulou’s Department store is an anchor in the community as well – there is a larger dept store and a separate shoe store with a huge children’s shoe selection — you can always what you are looking for! The Bagel Shop for Bagels, Montclair Egg Shop for breakfast, Gruber’s Cookhouse for lunch! Cute little wine bar called Duvin – not a huge selection but quaint atmosphere and pretty tasty wines. The miles and miles of trails in Redwood Regional Park, Sibley . Trailheads up and down Skyline and Grizzly Peak. Redwood Regional Park is one of my favorites if you have little kids though — huge structure, flat grass, and SWINGS!